“Everything is Awesome…Everything is Cool when you are part of a team!” Rather than hearing the Frozen song, this song rules our house! My wife and I hear it all the time. Thats because our 7 year old identical twin boys love legos and the LEGO Movie. 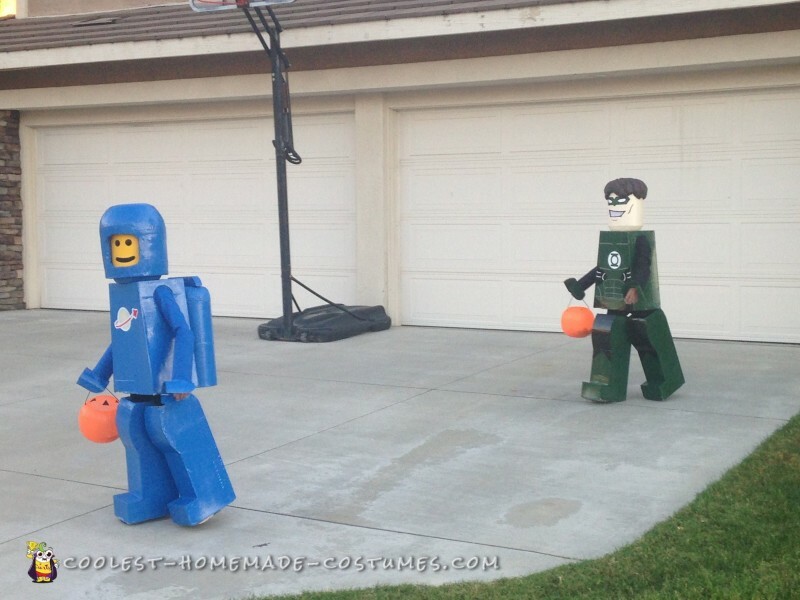 So, it did not surprise me when they asked to be lego mini-figures for Halloween 2015. I assumed other people have dressed up as lego mini-figures before and the idea was nothing new. 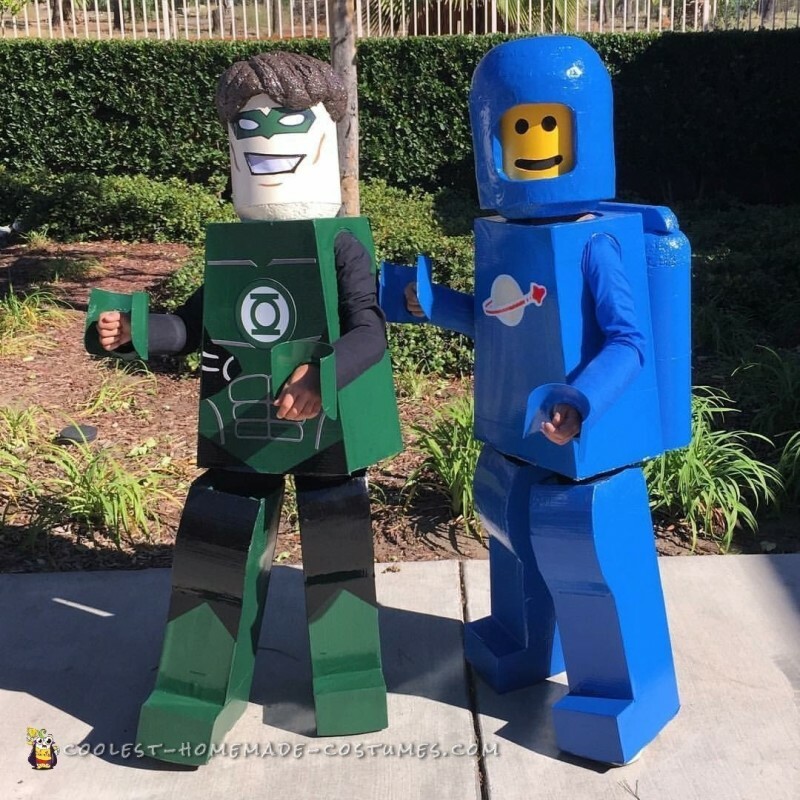 Searching the internet for lego costumes, nothing really stood out. So, my boys then asked, “Dad can you help us make Lego costumes instead.” Who can say no to that. So, then our search went to looking at previous made lego costumes. However, most photos that I did come across the lego costumes were subpar to say the least. So, setting out with a small budget and a plan, my boys and I went to work to make the best Legos mini-figures we could make. First things first, they each picked their favorite lego character they wanted to be. Logan, who loves green, picked Green Lantern. Aidan, who loves blue, picked Benny (astronaut). Second, we studied each lego character for what they needed to be complete. Third, we went out and purchased the supplies. Lastly, memories were made! 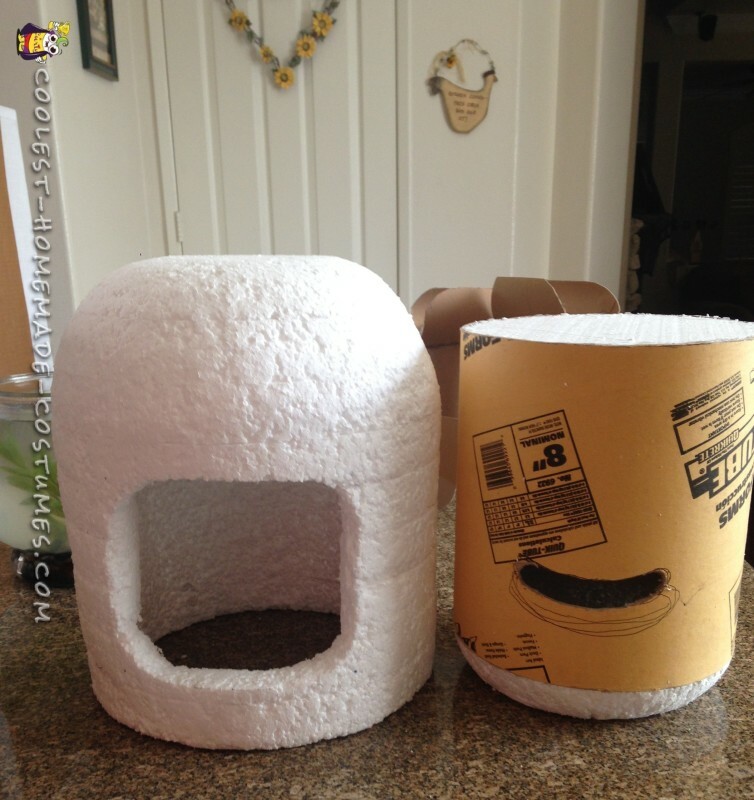 The materials consisted of cardboard, hot glue, large styrofoam insulation board (Lowe’s), hot glue, cardboard mailing tubes, hot glue, cardboard cement tubes, hot glue, fabric, hot glue, mod podge, hot glue, paint, foam and more hot glue. The time it took my boys and I to make their costumes was about 10 hours each over a 2 week span. Costs were about $40 each too. Making the costume…priceless. Not only did the boys help me make the costumes, they learned at the same time. They are in the second grade and are beginning to learn measurements with rulers which helped them out in measuring the parts. They learned about painting in layers, making graphics, and just good ol fun. First, we used a lego mini-figure and took tiny measurements and then I measured them to determine the sizes of each part. Secondly, they helped measure and draw out all the cardboard pieces. Cutting was done by dad for safety reasons. Then the gluing began. Lots of it. 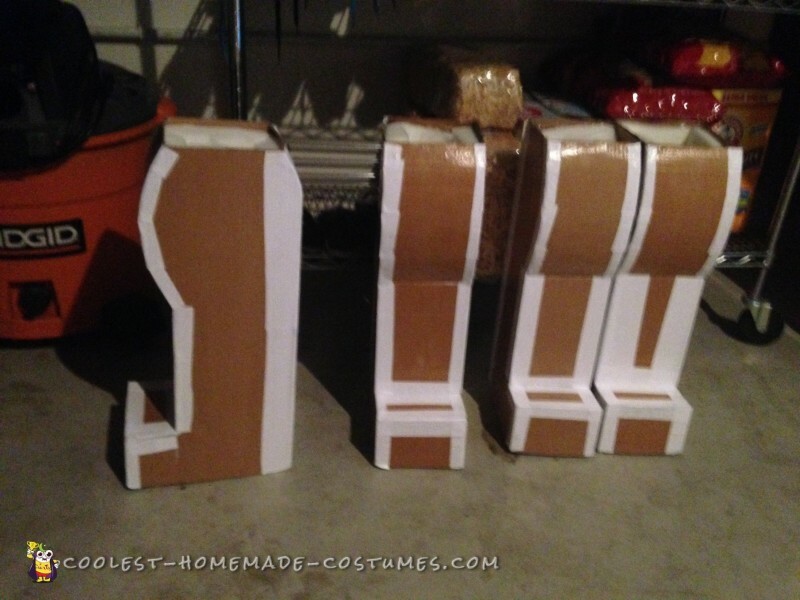 The legs and body were all made out of cardboard. 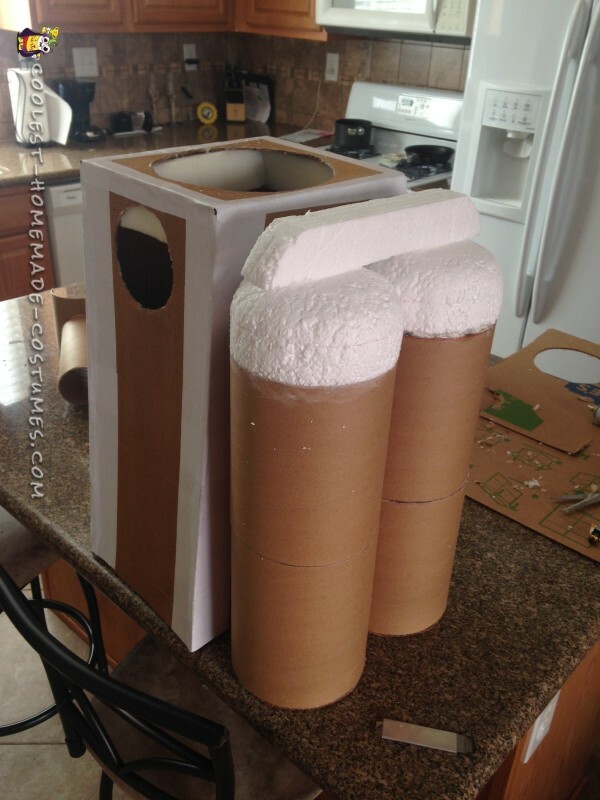 We added comfort with the addition of foam to the insides. This allowed the costume to have a snug and comfortable fit. The arms and legs were made out of the cardboard mailer tubes and fabric. 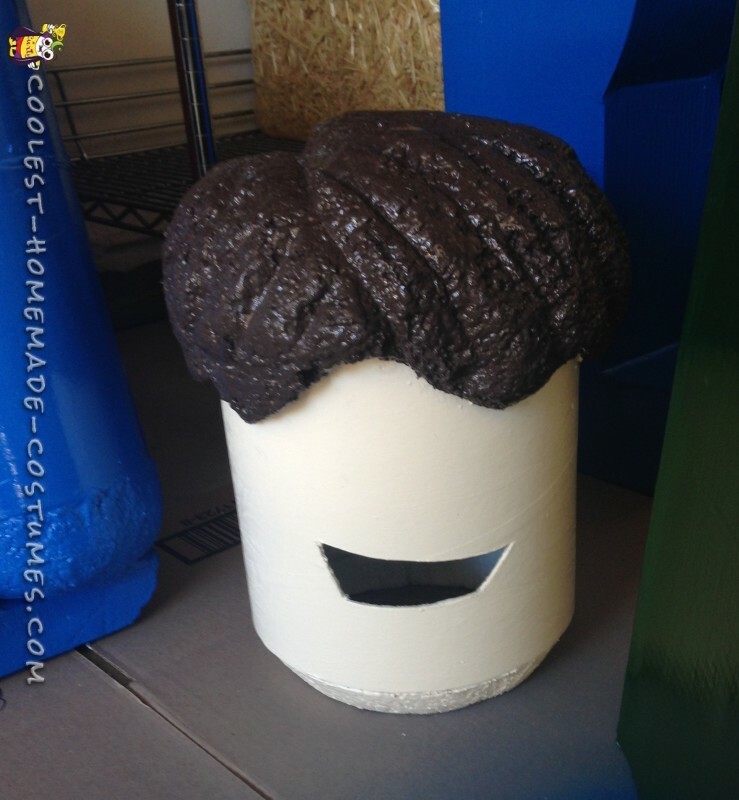 The heads were made out of the cardboard cement tubes with foam inside it. 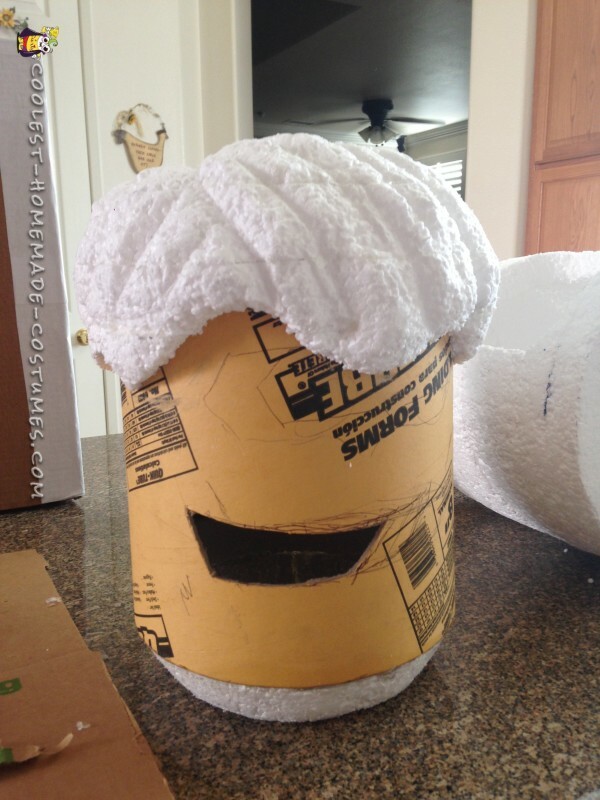 The hair and helmet were layers of styrofoam carved out, with the helmet having an added layer of paper mache for smoothness. Both boys had visual out of the mouth areas on the faces to see where they were going. Then layers of primer and paint were done in stages. The graphics were created on our computer and cut out and glued on rather than paint. When everything was done, the costumes fit great and the boys were excited beyond belief. Reactions…Oh my god. We now know to a certain extent what it would be like if our identical twin boys were celebrities and dealing with paparazzi. My wife and I stopped counting after 75 pictures were taken by other trick r treaters parents or from the homeowners opening the doors. Lets just say my boys have enough candy to last a few months. Thank god I took a backpack to store their candy as we kept emptying their pumpkin pails. People were giving them huge handfuls of candy, even king size bars and even a homeowner handed them packaged toys for having “the best costume” in there eyes. Parents and kids were amazed that we made these costumes, as I continued to repeat what we made them out of all night trick r treating. At the second to last house my boys went up to, the homeowner came out of his house to give me a handshake and he stated those costumes are awesome and the best he seen all night and the past several years. Halloween 2015 will never be forgotten from our household.